The M1 mixer family is our most popular line of mixers. These expertly constructed double balanced mixers offer remarkably low conversion loss with very little ripple across a broad bandwidth. 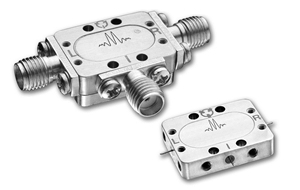 Additionally their well-balanced construction using high quality diodes leads to excellent Isolations from the LO to both the IF and RF ports. They are available in a wide variety of package options including surface mount, carrier, and connectorized as high as 26.5 GHz.